Lymph nodes are bean-shaped glands that are found throughout the human body. They are a part of the lymphatic system that caries nutrients, fluids and toxins between the bloodstream and the tissues. Having a strong lymphatic system is important if you want to protect your body from diseases. 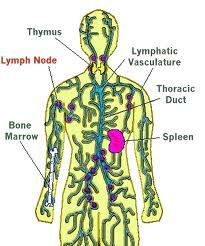 The main function of the lymph nodes is to trap and destroy the viruses and bacteria using lymphocytes. Where can you find lymph nodes? These nodes are found either singly or in small groups. The size of the lymph nodes vary depending on the function they have to perform. Some lymph nodes are as small as size of the head of a pin while others are as large as an olive. You can feel groups of lymph nodes in the underarms and the neck. You can also find lymph nodes in the abdomen close to the internal organs. How do lymph nodes get swollen? Since the lymph nodes of the abdomen are too small to be felt in a normal examination, your doctor could suggest a CT scan or sonography to examine the condition of the lymph nodes. You may also have to undergo a few other tests like endoscopic examination and blood tests to find out the cause of lymph node enlargement. There are many diseases that can enlarge the lymph nodes and it is difficult to known the disease which causes the swelling. Your doctor could do a biopsy (take a small sample) to find out the disease that is causing the problem. The treatment will start only after the doctor completes the biopsy. If the patient is not only suffering from swelling in the abdominal lymph nodes but also in the lymph nodes of the groins or armpits, the doctor may take a small sample from these areas. These samples are then sent to pathologist for examination. To extract a sample from the lymph nodes, the patient is either given local or general anaesthesia. The situation is different for patients who have swelling only in the lymph nodes of the abdomen. In such situations, the doctor may do biopsy of lymph nodes of the abdominal region using CT scan or ultrasound. The doctor is likely to pass a needle to the area of swell and take a small sample to find out the bacteria or virus that is causing the swelling. What happens if the biopsy does not yield any result? At times, the sample taken by the doctor is too small, which could make it difficult for the pathologist to give a correct diagnosis of the cause of the problem. Also, in some patients the lymph node is located close to an important or sensitive internal organ, which can make it risky for the doctor to conduct a biopsy. Traditionally these patients would have had to undergo a small operation so a sample is obtained from the enlarged lymph node. Today, since lymph nodes of the abdominal regional cannot be biopsied using CT scans, most doctors use laparoscopic biopsy to obtain a sample from the lymph node. How is laparoscopic biopsy performed? Laparoscopic biopsy is usually carried out after the patient is given general anaesthesia. The surgeon makes a small cut and inserts tube called cannula in the affected area of the abdomen. The tubes are connected to a special pump that pumps in carbon dioxide gas. When the abdomen gets filled with carbon dioxide gas, it is lifted up which makes it easy for the surgeon to extract sample from the lymph node. The cannula is then disconnected from the pump and telescope that is connected to a video camera is passed through the cannula. The telescope transmits the images of the lymph node to the television screen. The surgeon then gets the biopsy of the lymph node by inserting a long instrument through the cannula. The surgeon sends the sample the pathologist immediately to check its adequacy. If the sample is inadequate, the surgeon can more sample before completing the operation. The analysis of the sample can take up to 7 days because several tests are conducted on the sample.